Champion Petfoods is committed to nourishing your beloved pet as Mother Nature intended. Food digestibility is important for your dog or cats health and wellbeing. The recipe, ingredient quality and preparation all play an integral role in the final digestibility of kibble – as well as the bioavailability of vitamins and minerals. The high-quality ingredients, high fresh meat content and unique cooking process in all our ORIJEN and ACANA diets ensures that our Biologically Appropriate™ foods are digestible for your cats and dogs. It is widely understood that the cooking method has a significant impact on the digestibility of different pet food ingredients, even those originating from the same animal (Swanson et al, 2017). Not all heat treatment is equal. Some meat meals undergo a statutory requirement of 133 degrees for 20 minutes, but this is a single method of processing and does not reflect all types of heat treatment. Cooking and heat treatment reduce protein digestibility due to denaturation of protein. However, to maintain natural protein structure, Champion Petfoods uses low-temperature processing for many of our custom dried meat ingredients, as well as lowtemperature extrusion. Unlike conventional pet foods, our unique extrusion technique features a custom steam-injection system and gentle cooking process, preserving the nutritional integrity of the meat and other ingredients (Table 1.0). animal ingredient, such as chicken or lamb, which is seldom fresh. High heat processing in these foods denatures the naturally occurring proteins, making the digestibility of conventional meat meals less than that of fresh or minimally processed meat ingredients (Swanson et al, 2017). 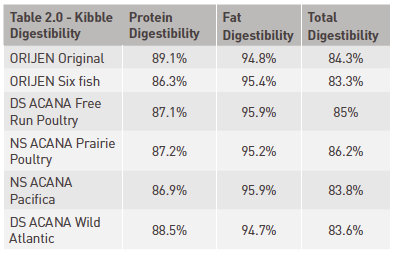 Based on the values represented in Table 2.0, one can see that the total digestibility of Champion Petfoods’ kibble exceeds that of all processed and unprocessed meat ingredients from Table 1.0. Table 1.0- Adapted from Swanson et al, 2017. Shows the digestibility of different ingredients based on their processing method. All values are approximate. Steaming increases digestibility of raw chicken due to the breakdown of connective tissues. Total protein digestibility is not reported; individual amino acid digestibility is reported on the poster, not transcribed above. Table 2.0- Digestibility of various NorthStar® and DogStar® ORIJEN and ACANA diets. All fall within extremely close range of one another. Brief: Some people claim that today’s dogs bear little genetic resemblance to their ancestors, and therefore don’t require their ancestors’ diet. However, the science behind our foods rests on a large body of research with a clear conclusion: modern dogs are overwhelmingly similar to their ancestors, and should be fed as such. In this bulletin, we’ll look at starch-digestibility studies and reinforce the necessity of a Biologically Appropriate diet for dogs. Brief: Starting with a review of the eating anatomy of dogs and cats, and their evolutionary adaptation to meat and protein based diets, Champion’s White Paper provides and in-depth explanation of the Biologically Appropriate nutritional philosophy. The White Paper also covers the history of commercial pet foods, and explains how conventional dog and cat foods came to be and why they continue to use commodity ingredients and produce carbohydrate based foods. The document concludes by reviewing the many pet food myths that consumers face in choosing a suitable food for their dogs and cats. Brief: This review looks at the effects of dietary protein concentration on various mammalian species, with a focus on companion animals and the rat. This review presents numerous studies which validate that protein does not progress renal injury in dogs and rats are not an appropriate model for assessment of kidney function in the dog. The review also demonstrates that restricting protein in senior dogs does not have a protective effect against chronic renal disease. Brief: A review of the evidence regarding the safety of dietary protein in dogs. This review concludes that protein does not adversely affect kidney function and that protein restriction in senior animals is unnecessary and can be detrimental to the health of the animal. Brief: Taurine is an amino acid which can only be found in animal protein. It can be synthesised in dogs from the precursor amino acids cysteine and methionine. It is not present in vegetarian protein sources such as grains and/or legumes. ACANA Lamb & Apple Singles formula uses FRESH and RAW lamb meat as the first ingredient and contains WholePrey ratios of meat, organs and cartilage. Of the 27 percent protein in the ACANA Singles foods, more than 85 percent comes directly from the meat and organ inclusions, which are rich in taurine.